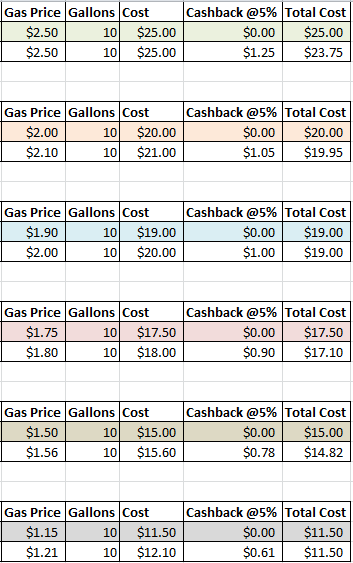 I wrote a post a while back on the effectiveness of gas credit cards and wanted to revisit that topic. Gas prices plummeting in recent months and when you get a percent cash back, the actual dollars become less and less as the price goes down. When I initially wrote that post it was with the expectation of gasoline continuing to raise. This made cash back credit cards even more effective compared to paying with cash. With gas prices now heading in the opposite direction, things have flipped and cash may be king once again. But what exactly is the price point where this happens? I hope to analyze that and provide the answer for you in this blog post! The first point I want to address right now is that if you don’t have a card that gives 5% cash back on gas, you should be applying for one or paying with cash instead. A 3% cash back card might cut it, and a 1% cash back card is not worth it in most cases. I recommend using the Sallie Mae MasterCard. The Chase Freedom and Discover It offer 5% cash back on gas during certain quarters of the year. There is also the PenFed Platinum Cash Rewards that give you 5% cash back if you have an account with them, as well as the Fort Knox card that always gives 5% cash back. So there are quite a few options out there for you to choose from. In each example the top highlighted price is representing the cash price at the pump , and the bottom represents the credit price you might be paying. I then included the amount of cash back you would receive from paying withe credit and then the total cost to you after cash back is applied. Only use credit if you have a 5% cash back card or if you live in an area where the cheapest gas station charges the same price for cash and credit. 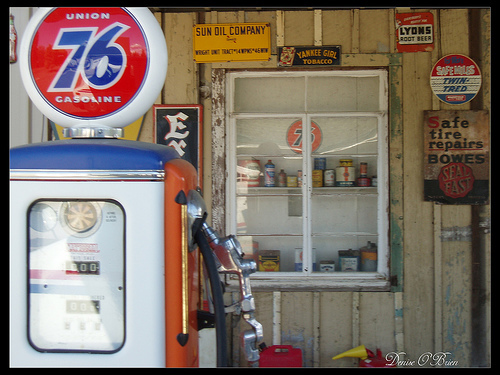 Always go to the cheapest possible gas station if you are going to be using credit (or cash). Check out www.gasbuddy.com and use their maps to find the best deals on gas near you. I hope this helped once again and that you take advantage of cash back to save a few extra dollars at the gas pump! This entry was posted in Save Money by Debt Hater. Bookmark the permalink. That’s awesome! I wish I had the “problem” that you speak of not driving enough, haha. Since I don’t spend enough to take advantage of sign up bonuses, I stick with straight cash back cards for now. I will definitely look into other rewards on travel and airfare once my spending increases.